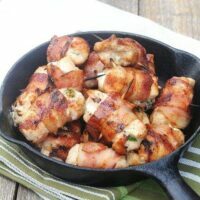 These Bacon-Wrapped Jalapeño Chicken Bites are flattened chicken tenders stuffed with cream cheese that is laced with chopped jalapeño pieces, then wrapped with bacon. They will make the men in your life go crazy. I promise. Add bacon to anything and it will fly off the table. That’s what a caterer once told me and I believe it. Certainly applies here. Whether you’re planning a cookout this weekend or cooking indoors, grill up a few of these sizzling treats for a quick appetizer or serve as an entree. I can’t think of a better way to celebrate the Fourth of July than with a big plate of these spicy and cheesy, smoky and crispy chicken nuggets. If you don’t like spicy, leave out the jalapeños or skimp a bit. I definitely prefer fresh jalapeños over the canned or pickled ones traditionally used with nachos. They are milder and prettier too. Seed and chop fresh jalapeño peppers. Smear cream cheese on top of each tender and sprinkle with peppers. 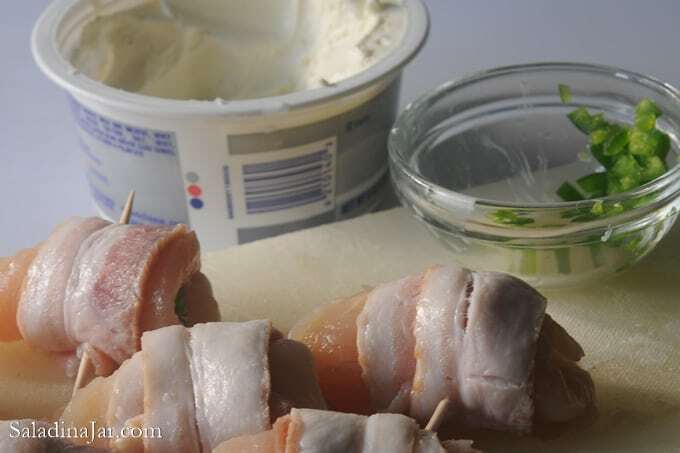 Roll bacon around folded chicken tender and secure with toothpick. Recipe slightly adapted from “Warren’s Chicken Bites” published in Home Cooking with Trisha Yearwood. 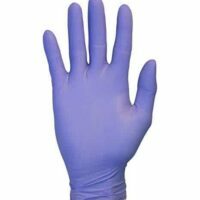 Be sure to wear plastic gloves when handling fresh jalapeños. The oil will attach itself to your hands and is not easily washed away. An inadvertent swipe of the hand close to your eyes could be an unforgettable experience. I need to make this tonight! The flavors together must be amazing! It’s Memorial Day and we want to grill these, but rain is on the way. Think they will be good in the oven too? I make these all of the time. I do not use the cream cheese and I use jalapeño slices. I also marinate mine in Italian dressing before putting them on the grill. These look so good. The only thing i wonder if the chicken would be completely cooked when you grill the bacon. Thank you for the recipe. Actually, the chicken cooks almost faster than the bacon. Do not use thick-cut bacon as it takes too long to get crisp. You’ll see what I mean when you try it. Anne, I have not personally tried it but many of my readers say they are good. You can look through the comments for specifics. I’m going to try these for a party this weekend, I normally just stuff 1/2 jalepeno with the cream cheese and wrap the bacon, for added flavor I add some dry ranch dressing mix to the cream cheese. Could these be broiled in the oven, without losing any flavour? Cathy, Haven’t tried it but don’t know why not. Watch carefully. Whats an alternative to grilling if you don’t have a bbq or a grill pan? Found your recipe via Once a Month Mom and the tip on flattening meat in a ziplock bag…GENIUS! My bites are in the oven right now (raining here in West Texas today so no grilling outdoors). I can’t wait to sink my teeth into them! Thank you for such a great and easy recipe. Hope you enjoyed your chicken bites….and the cooler weather. The chicken bites were aWeSoMe!!! Everyone loved them (Non-jalapeno ones for the kiddos). This will for sure be a repeat recipe in our family. Thank you again! I going to make these on our summer camping trip. They should be a hit! I’ll do all the prep work at home and pop them on the grill when we get there. Thanks for posting such great recipes! I made these for a dinner after golf outing. I put them in the oven covered at 300 degrees while we played 9 holes. ( we live on the golf course) I checked them when we returned 2 hours later and they were perfect. Removed the foil cooked a little longer and served . They were awesome! I added a little salt and garlic and they were all gone! No leftovers:(!!! I have lots of people ask me how to make these in the oven. Thanks for sharing how you did it. This was awesome but I did tweak the recipe since my family loves heat. I created a dry rub of salt, pepper, red pepper flakes and garlic powder for the chicken–had it marinating for about 15-20 min. I did use the fresh jalapenos pepper but I kept the seeds in…definitely has some serious kick now. Thanks for the recipe! Have you baked these in the oven? Was wondering time & temp. Made these camping – I used the “chive & onion” flavored cream cheese spread – everyone loved them. That’s a great idea Kelly. And camping is a good time to make these as they are rather labor intensive. Thanks for writing. Thanks for sharing this! I am going to be trying it tomorrow! Really nice, thanks for the recipe! These are to die for! Easy to make! I made these last night and they were incredible. I did some of them without jalapenos but added cheddar for the children. I basted them with bbq sauce on the grill. Thanks for the recipe. I think I just found what’s missing in my life… these. They look so good! I purried the jalapeno and mixed the juice with the cream cheese. Evened out the spice. Is there a substitute for grilling? Our grill is out of commission right now…it didn’t survive the winter! I have only baked these once and I can’t remember how I did it, but it worked. If you look through the comments, you will see how some people have done it. Sorry about your grill. Hoping I can use these in a low carb/gluten-free superbowl round up. Let me know if that’s okay by you at [email protected]. Thanks! My sister makes something similiar to these that are amazing!! She just halves the jalapenos and puts a piece of chicken inside a half and an onion slice and wraps it in bacon and puts a toothpick through! Let me tell ya sooooo good! Can’t wait to make these for my dish to pass christmas party!!! I love southwest chicken rolls so I think I’ll marinade the chicken Adobe style and stuff with spinach, corn, cheese and jalapeno peppers!!! Whoa, I’m drooling!!! I’m thinking of making these for a thanksgiving app, would the bacon crisp up the same if I baked this? You had me at, “Bacon wrapped.” Looks great, can’t wait to give it a try. I make the peppers with cream cheese and bacon but since my boyfriend doesn’t like cream cheese I use pepper jack cheese instead and it gives it a little bit more of a kick I’m going to try this tonight with the pepper jack cheese. I made these tonight and they were delicious!! I left the peppers out of some of them for my kids, and they loved them, too. However even the ones with the peppers were not really hot because the peppers are seeded. The cream cheese works well because it doesn’t leak out when grilling. Thanks for writing to say so. I was surprised about the cream cheese too when I first made these. I made these, not thinking of the size and realizing it was an appetizer, as a main dish. They were gone in no time at all. They were super delicious! I’m already thinking ahead to do a bigger version for a main dish because these are way too good to only serve on special occasions! Thanks for sharing! Thanks for the link Sarah. Looks like they turned out really good for you. Just found the recipe for the bacon/chicken/jalepino bites, can’t wait to try it!! My mom showed me this over skype last night.. pretty sure she has the picture as her desktop image.. and I immediately made it for dinner. But, I stuffed the chicken breast! It was so amazing! My boyfriend ate 2. So thank you for the wicked recipe! Sounds like your boyfriend was impressed. My sons go crazy for it. That was a generalization based on my own experience. However, pickled or not, jalapenos come in all different levels of “hotness” so you make a good point. Thanks for writing. Just wanted to say thanks for the recipe, we tried it out last night and it was yummy. Jessica, I have not baked them myself, but many others have. One girl told me, 350 degrees for 35 minutes. Another reader suggests putting them under a broiler to crisp the bacon at the end. You may have to experiment a bit. Love this and I’m making these for my next festivity. Just pinned! Made these last night for a group of my friends, but didn’t cut the chicken in half and served it as a main dish (everyone ate 2 of them). Everyone LOVED them! Prep time was totally worth it. Will definitely make them again!!!! This recipe is pretty basic. I can suggest a couple of tweaks. First, start out by soaking the chicken in a simple brine solution of 8 cups water, 1/4 cup salt, and 1/4 cup sugar. Brining the chicken will keep it moist and tender during grilling. Second, a few simple seasonings are neeed, I used some black pepper, garlic powder and sage sprinkled on the chicken before assembly to round the flavors out. LOVE this! Just made this for dinner and it came out fantastic! The only thing I did different was mixed room temp cream cheese and the cut jalapeños into a bowl and spread it with a knife on both sides (inside not outside)of the chicken as if I were doing bread and butter! Cooked for [email protected] then another [email protected], bacon and chicken perfect as can be!! In a small bowl mix cream cheese, jalapenos, minced garlic and a bit of drained crushed pineapple. Before assembling these, I marinated the chicken pieces in a mixture of Apple juice and worchestershire.OMG! Yum! I made these at work today. Smoked them with maple wood @ 200F, then finished at about 300F to crispy up the bacon. They turned out fantastic and everyone loved them. Thanks for the great recipe! 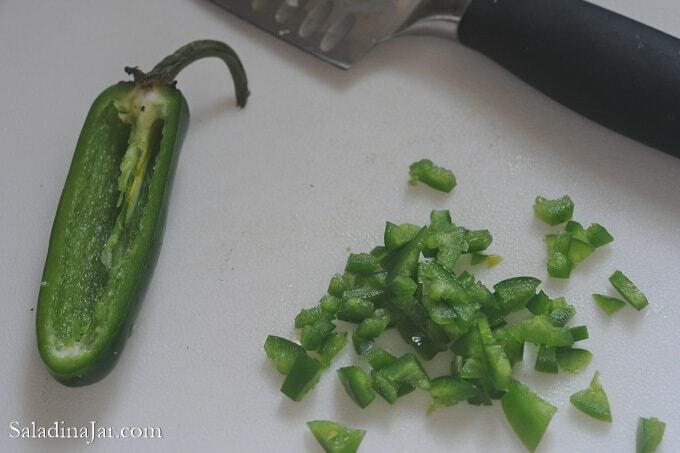 Here’s an awesome tip for all of you jalapeno lovers like me! Baby wipes don’t just alleviate the burning pain it stops it immediately! I had been dicing fresh from the garden “Biker Billy” jalapenos and realized I had to GO ! So I quickly washed my hands with soap and water dried my hands and went to Go #1. ( Trying to keep it nice here ) and OMG what pain ! Nothing made it go away until I thought …. I had baby wipes from my grandaughters visiting ! Voila ! Pain gone ! Completely ! Amazing ! Just an fyi to fellow jalapeno lovers ! Here is a remedy for the pain jalapenos can cause, but first my stupid move, I had washed my hands with soap and water after cleaning jalapenos. Then I used the bathroom and OMG ! I knew I was in trouble, nothing helped alleviate the pain! Then I remembered I had a carton of baby wipes (I babysat a grandaughter alot ) So I used a baby wipe and the pain was instantly gone. Instantly ! Omg, my mouth is watering!!!! Can’t wait to try this recipe! i added a packet of ranch seasoning to the cream cheese…..came out wonderful! Instead of grilling them, could i just cook them? I really want to try them right now but i dont know if the taste will be alot different, or if it would even work! Delicious! I made these last night. Very easy to make. 1 package of bacon and 2 chicken breasts fed 4 people. If you haven’t tried or made these yet, you are missing out!!! I made this tonight. I did some as the recipe indicated and yielded 4. But to appease all the flavors the household likes, I also used the other ingredients with this recipe in a few tweaks. 2) I added green onion slices to a few in both cream cheese and cheddar. 2) I added a dab of salsa to both the cream cheese and cheddar. In ll I have used 2 pounds of tenderloins and I produced 16 good size portions. they were very tasty. My son dipped his in honey bbque sauce. I would recommend the original recipe as written as it was very good. But I also think with these staples, the sky’s the limit and you can experiment with a variety of flavors. Very kid friendly, too! Yum! Great recipes for appetizers! Those look so delicious! The recipe could be interchanged though, what about using brisket instead of chicken? 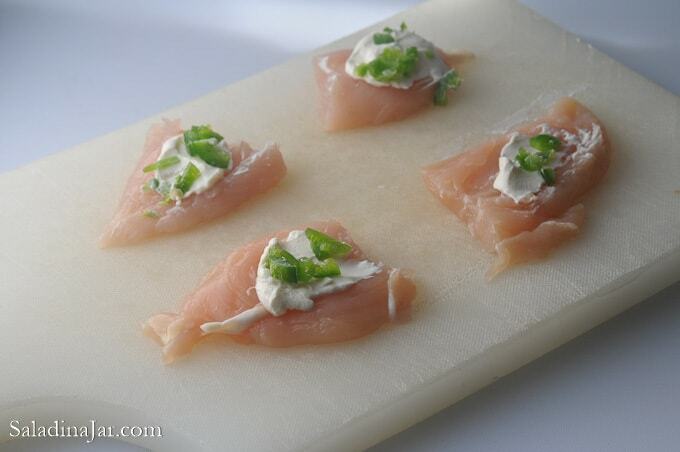 That’s a great idea for some delicious appetizers at a BBQ or something! NICE! Can you bake these? If so, for how long? OMGGGGGGG. These are fantastic looking. I’d eat them with El Yucateco green hot sauce. Yum. I made earlier this week on the bar b q. They were excellent. I also stuffed some sliced bell peppers. What would be a good time and temp for oven baking them? Any ideas? It’s to cold to grill in OK.
Could I bake these instead of grill them? Just stumbled across this on pinterest and I LOVE the idea. I’m going to attempt to make it for a Superbowl party. I do not own a grill, sadly, but would a grill pan do the job?? Thank you!!! These are WONDERFUL!!!! I just made them and they are great!! To make a little less fattening I used reduced fat laughing cow spreadable cheese and it came out amazing! My boyfriend devoured them. I also added a little pepper ad garlic powder on the insides and around the chicken before wrapping the bacon. We loved these! Great and easy recipe! Thanks! When I make these, I use canned jalapeno peppers. I mix equal parts of honey and the juice from the can of peppers for a marinade. I also put them on skewers for easy turning. Delicious. Just wondering for the grilling part, how hot do you have the bbq and do you put them straight on the grill or use one of those veggie cookers? I’ve never put bacon straight on so just wondering what is the best way… could these be done in the oven? Tina, straight on the grill. Haven’t tried them in the oven but others have. You might read through the comments. A caterer years ago in Houston made these and it became a family favorite. It was originally made with dove meat but I adapted it to chicken. Flattening the chicken is important. I used a white cheese instead of cream cheese. I also marinaded it in a white wine. You can cut the roll-ups in half if you want to serve as an appetizer. Duck hunting season in Louisiana! We substitute the chicken for the ducks….actually the only way I will eat duck. The kids call them duck bombs! Hi Tammy, I think that is the only way I would eat duck too. Thanks for writing. My boyfriend LOVES these! I’ve made them for him before and will make them again tomorrow. What kind of an entree goes well with these? Loren, that’s a good question. Maybe barbecue, macaroni and cheese or baked beans? My husband is a big duck hunter and we do these with duck breast…will have to try this! YUM! We are grilling these as I type this!!! Soon excited!!! This are fantastic! I made them today for my hubby and I and we both loved them, plus it was quick and easy! Made these tonight, only I baked them at 350 degrees for 35 minutes! We loved them! This look absolutely fantastic! I’m always on the lookout for new ways to use chicken….add that heat and I’m all in. Thanks for sharing! I am a college student and while this sounds absolutely amazing and I would love to try, I don’t have a grill. =[ Do you have an equally fattening way to make this tasty looking bite. Baking takes all the greasy fun out of it..
We do these with pepper slices and a dab of cream cheese. Wrap with turkey bacon too. Then me grill them out doors. Yummy. Cuts the gat using turkey bacon. And just a dab of the cream cheese cuts the fat too. Grilling helps too as any grease left then drips down into the fire. So we feel these are a pretty lean choice! Try substituting the chicken with duck breast. its fantastic. These look yummy! I make something VERY similar……just add a slice of water chestnut . Put the thin slice of chestnut on top of the cheese mixture, then roll and wrap! these were so good! I ended up baking them and the cheese came out of them, but I just served the cheesy sauce on top and it was delicious! thank you. I hope you don’t mind but I linked your recipe on my blog, had to share this one! I tossed it in a little bit of ranch dressing right before I severed it was amazing !! So creative! Thanks for the tasty-sounding recipe. Hi Tori, Hoped they turned out really good for you. Thanks for dropping by. Glad to hear it, David. Hope they turned out great! We use backstrap of the deer for this recipe instead of chicken. It’s so good! Awesome Idea! Should these be BBQed or Baked? I have had a recipe similar to this on my to-try list forever. Your photos have prompted me to really give it a go. I think we will love it. This looks so fantastic! I can’t wait to make it! New to cooking, and have had multiple failures. I decided to try this recipe out because of the picture. Followed your directions and it turned out AMAZING, whole family loved them. Love the site, the pictures, and the easy to follow cooking direction. I made this tonight for company. I used full-sized breasts, however which made for much less work, though a longer cooking time. Instead of toothpicks, I used 4″ wooden skewers that were soaked in water before use. It was well-received. I did also season the outside of the breasts before assembling. I used fully-ripe red jalepenos, which are hotter but don’t have that ‘green’ flavour that give green jalepenos the bitter edge. This was quite good. I have never used fully ripe jalapenos. Have to give that a try. I like your idea of making this an entree. We do grilled stuffed jalapeños all the time but never like this. I will give this a try and I know it will be a hit. I have been catering for 20 years and it’s true about bacon. WOW! this sounds amazing. I can’t wait to try this out. I hope you don’t mind, but I posted this on my blog too and placed a link back to this article. Well don’t those little things just look delicious and a half! Going on my next bbq menu for sure!! These look fantastic. I’m wanting to make them a bit bigger for a dinner entree, and I was wondering if they would be okay baked in the oven instead of grilled? These are very similar to what I’ve come to know as ABT’s (Atomic Buffalo Turds). Difference is: Cheddar spike in the center of sausage filling. Stand up in pepper tray and smoke for a few hours at about 250 Deg. Thees look great and I will definitely try the chicken version next time. Thanks for the post! I just found your site via Pinterest (which of course makes you a little famous). But you are now in my favorites. Keep cooking! This is one of my favorites! I found your blog through stumble & had to make these again. I coated the chicken in olive oil and I mixed the jalapeno into the cream cheese & garlic. I used canadian bacon and it was delicious 🙂 I also tried this with shrimp but used smoked gouda instead of cream cheese. Lauren Ann, You are full of great ideas. Can’t wait to try some of them. Made these and everyone loved them. SUPER easy to make and simple ingredients. I went really light on the jalapenos thinking it would be too spicy, but could barely taste them so next time I need to kick it up a notch. Also, I would make more than the 16 listed in the recipe…they go fast! These look amazing!! I am going to have to make them with my kids this summer. I sent you an email, but I would love to feature this on my blog! This recipe sounds wonderful! And it’s so simple! I live in Southern Thailand and as you would imagine, it’s difficult to find some ingredients here. This recipe, however, is one I can definitely make…except maybe for the jalapeno peppers. Although I’ve seen them here, when they are about, they are only available fresh (not pickled) and are typically very expensive. Hi Jeeem, No jalapeno peppers? Bet you have something similar. Thanks for taking the time to leave a comment. I know you will enjoy this recipe. Nick, Of course. More cheese makes anything better. Those bacon wrapped jalapenos look yummy! I will certainly give them a try – it’s new to me as in my area we don’t eat such things. I’m hosting a party in a few weeks and am just looking for some yummy and mouthwatering recipes. Thanks for sharing. 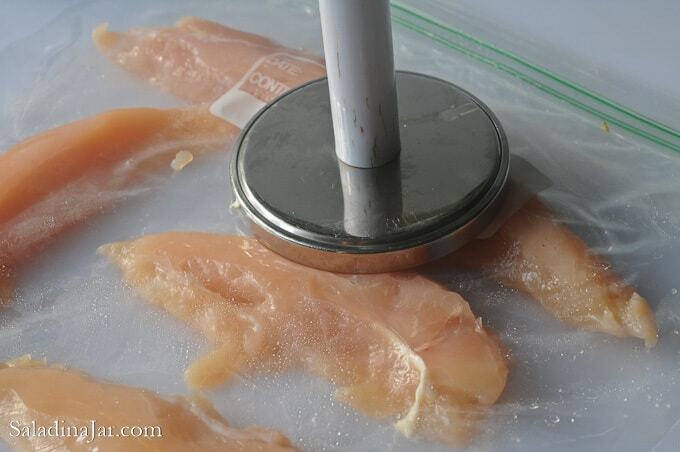 But don’t waste a zip-loc when flattening your chicken breasts. Two sheets of saran wrap (on above and one below the chicken) work just as well! Just make sure to cut the pieces of saran wrap large, since the chicken will be expanding. Hi JJ, Thanks for stopping by and taking the time to write. Good hint. I prefer Ziplocks only because they contain any splatters. Guess I’m kinda messy with the whole process. But plastic wrap is certainly a viable alternative. What a great idea on the chicken bites. My husband will love, love, love these. This recipe looks really YUMMY. I have never thought of wrapping chicken with bacon but I am going to try it the next time we bbq chicken. Life is better with bacon. Period. The bacon made this taste awesome. And that extra jalapeno add’s an intense flavor to it. I just made these and they were good but not very spicy at all. I was hoping for a little bit more heat from the peppers but they were super mild. It is a good appetizer for a party and I will be making them again. A couple of thoughts Cindy, Jalapeno peppers vary wildly in amount of heat so you may have gotten a mild pepper. Also, you could use chopped pickled jalapenos out of jar and get a lot more spice if that’s what you’re after. Glad you liked them anyway. Can anything be used besides jalapenos? You can add a pinch of cayenne pepper to the cream cheese. Thanks so much… makin em tonight for a party, probably will be the life of the party!!! Can You toss them in the oven instead of frying? I live in an apartment with a crappy electric stove. I made these last night and they were amazing. You don’t need a grill either, I just did it on the frying pan. If you keep a careful eye on them the bacon wont burn and they were oh so delicious. This is coming from a 20-year old guy in college who really doesnt have the time to make anything special. It’s easy and SO GOOD. Hey I know this recipe says grill but is it possible to do this in oven? And in what temperature? yes they do look delicious and such a great idea but wouldnt the middle wit the cream cheese being there be rare because the bacon cooks fast,but idk i guess if you tenderized the pieces enough..
Seth, You don’t use much cream cheese and the chicken is thin so there’s not a problem. Try it. I think you’ll really like them. This sound like something we do here in Texas, except I use quail breast instead of chicken. They are great. Like your site Paula, I will check back from time to time. I made these last night after stumbling across your site. The wife was concerned that she may not like them because of the jalapenos, but she loved em and so did I. Even my teenage daughter loved them. Replace the Chicken with Shrimp and use deli Havarti Cheese. Throw them on the grill just till the cheese melts and Shrimp turns white. I guarantee you will never taste anything like it. They sell these at restaurants for $14.00 a half dozen. I make them at home for about $4.00 a dozen. They never stick around long. Thanks for sharing Clint. That sounds fantastic. Will definitely give it a try. I love that there are four ingredients for such a delicious appetizer. Totally doable–and delicious! Thanks! Also, great photo spread. What program did you use to make that? So simple, clear, and space-saving. Thanks for your kind words Evelyn. I use Photoshop for single pictures but I construct the storyboards in Photoshop Elements–only because I haven’t figured out how to do it yet in Photoshop. My mom has made a similar recipe for years- without the cream cheese and substituting tenderized deer roast marinated in italian dressing for the chicken. I’ve seen huge platters full disappear in minutes. It’s the best deer recipe you’ll ever try. My girl and i made these one night. They were DELICIOUS! A friend of mine makes something very similar. He’s on the BBQ circuit. He calls them Armadillo Eggs. Same ingredients, but instead he puts the chicken in tiny cubes with the cheese inside a cored jalapeno shell. Wrap the bacon and grill. I’ve made them too, and I found that boiling the jalapeno’s first to soften them a bit helps before grilling. Anyway, I’ll try this variation for our family reunion in two weeks. Thanks for the post. Made these yesterday and they were amazing. I didn’t de-seed the jalapenos though (I like spicy food), and used a whole strip of bacon for each. I mix shredded cheddar and jack with the cream cheese. You should try it. It’s better. I will try. Sounds fabulous! Wow! My son found this recipe and forwarded it to me. I made them tonight and they are fabulous!! They will definitely be a repeat. I used fresh jalapenos and the heat was just right. Mine came out a big big for a one bite appetizer so I will adjust them the next time. I could see mixing some Colby Jack shredded cheese in softened cream cheese for an alternative. Wide open for interpretation! Thank you for a great recipe and a great web site. Salad in a jar – that’s my next try. Colby Jack would be wonderful. Can’t wait to hear if you try the Salad in a Jar. I’m currently cooking these cant wait to see how they turn out! had these last weekend but without the cream cheese. also used strips of jalapeno, not diced. and they used rabbit. OMG!!!! it was wonderful. there is an Australian restaurant near Gilbert, Arizona that we went to. they served them. love this creative variation. I’m usually boring and use wrap asparagus with bacon… but the jalapeno idea is great! These were awesome! We just made them for dinner (I prepped them and my boyfriend grilled them). The next time, I will add a bit of seasoning to the chicken and/or cream cheese. Maybe a bit of pepper, garlic and onion powder. The extra seasoning seems like a wonderful idea! we smoked ours and then finished them off in the oven. YUM!!! Jalapeno poppers meet chicken with bacon on the side? I am shivering with anticipation. I’m picking up the fixins’ tonight. I make pretty much the same dish, but with shrimp. Preparation can be a little time consuming, but they are great. We dip them in ranch dressing. Fresh jalapenos are the best. I make these without the chicken. I use the half a jalp for each one and put the cream cheese in the pepper shell and then wrap in bacon. I’m sure its delicious with the chicken added. They are definitely my favorite appetizer. Just curious, how would this taste without cream cheese? Family is not big on it!!!! Seems like it would change the character of the dish dramatically. Do they like “spicy”? 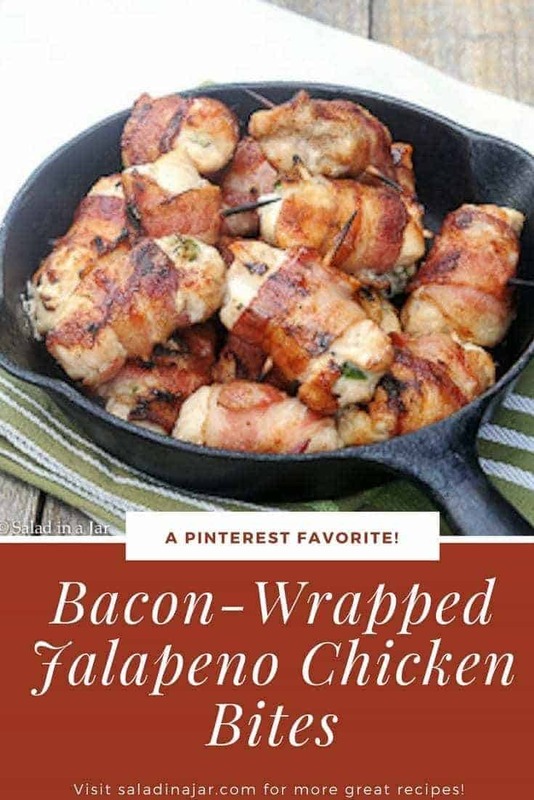 Perhaps you could roll a strip of jalapeno up inside the chicken and then wrap with bacon. Let me know if you try it. maybe you could mix some shredded cheddar-jack in the cream cheese.. the bacon-jalapeno marriage needs something creamy to make it dreamy. unless you don’t do dairy at all, in which case i send my condolences. we cannot all scream for ice cream. I stumbled across your Awesome Web page!!!!! I can’t wait to be able to start cooking!!!!!! This is just beautiful! I’m going to make it this week! Really like the thought of making the chicken bites for appetizers at our next gathering! Heed the warning about being careful of chili oils…anyone who works in the industry will tell you that it’s not the eyes you really have to worry about, but pretty much any sensitive areas or mucous membranes. It’s easy to cripple yourself with pain for a while. Adding bacon does make everything go quickly, but so does frying. I’m wondering how these would be with a tempura batter and a cilantro lime chili aioli. We’ve been making something similar for awhile… but we use pheasant and stuff the bits inside the jalapeno halves. Then drizzle honey over them after baking them in the oven. Honey? M-m-m-m. Sounds good. We also like to dip them in barbecue sauce. Wow, those look crazy good! And what a fun appetizer for a summer party! These look like they might be fattening. Where can I find more? 🙂 I agree – I read “bacon-wrapped” and had to get the recipe. These look so wonderful – you have a knack with making non-baked goods look quite appetizing – I’d hate to see what mine looked like. This looks like a real winner in my family (cept for mom) – but peppers aren’t for everyone! Oh – 64 was the high today, cloudy and sprinkles. Welcome to the club – and Happy 4th! Mmmm–very appealing appetizer for my next BBQ! Wow, these look so so good! I will definitely make them sometime, I know everyone will love them! Those suckers would be gone in about 2 seconds at my house! I am definitely making these–we love our spicy food! These chicken bites look wonderful. I may have to make these for my sister when she comes back from CA. I will tell her I am making them for her but I agree with Kyle. I want some!!! I am printing this out now! Thanks so much. I miss the Texana restaurant and their Joe-Bob’s chicken. This looks like a good substitute. Thanks. I miss that place too!